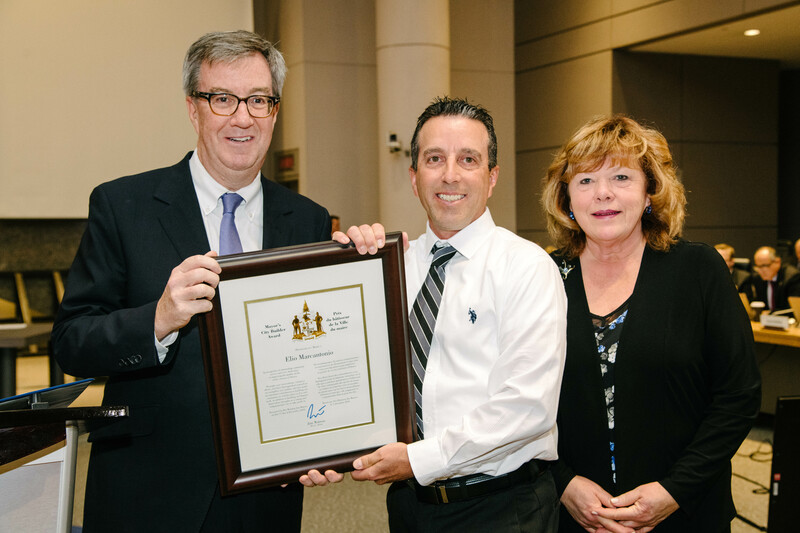 Mayor Jim Watson and Barrhaven Ward Councillor Jan Harder presented the Mayor’s City Builder Award to Elio Marcantonio at City Council today, in recognition of his work to bring the community together and establish a BMX track in Barrhaven. Elio Marcantonio formed the Nepean BMX Association, a non-profit organization, and developed a BMX racing track on Strandherd Drive to provide a new recreational facility for the community. Mr. Marcantonio acquired the land in Barrhaven with the help of Councillor Harder, and spent hundreds of hours designing and building the state-of-the-art track. The Nepean BMX Association is an inclusive and family-friendly organization that promotes a healthy and positive lifestyle. It is one of the fastest growing and largest BMX associations in North America. Mr. Marcantonio, his wife, son and two daughters all race BMX at the track. Since hosting its first race in June 2013, the Nepean BMX track has created a positive economic benefit for the area and has become an important part of the community. The track brings in riders from across Ontario, the rest of Canada and the eastern United States for races. Mr. Marcantonio, along with association members and volunteers, works continuously to improve the track, which hosted the Capital City Nationals in 2015, 2016 and 2018.